Stoner Xenit Citrus Spot Remover - 10 oz. 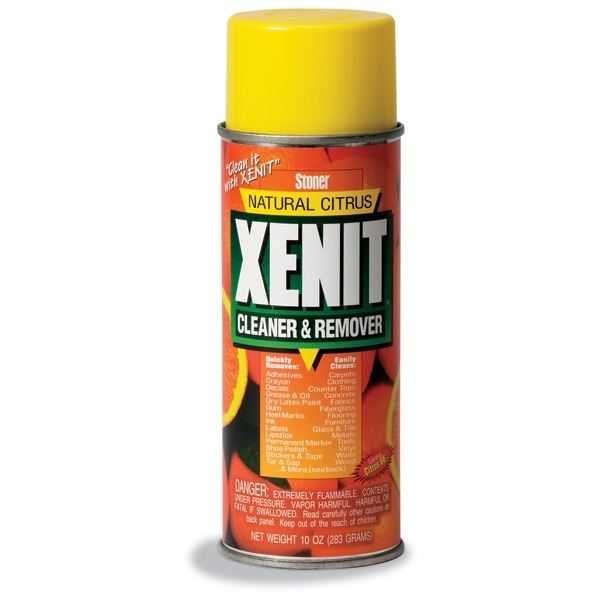 Stoner Xenit Citrus Cleaner 10 oz. Aerosol Can removes adhesives, gum, decals, labels, crayon, grease, marker, ink, shoe scuffs, tar, sap, and other sticky gunk. XENIT is the fastest and easiest way to clean difficult grime from carpet, glass, metals, fabrics, countertops, flooring, upholstery, vinyl, walls, and more. XENIT removes the stuff that soap and water can't. XENIT even lifts dried latex paint, lipstick, and permanent marker. XENIT contains NO soap or water. Instead, it contains more powerful ingredients like Citrus 66, a natural cleaning solvent. Unlike most water-based cleaners that just lift and carry dirt, XENIT's MicroActive cleaning action loosens and breaks down the complex molecules found in sticky materials and difficult stains. XENIT leaves no residue, has a pleasant orange scent, and contains a disinfectant to help kill germs and odors.